I found an old picture of myself when I was about 10 years old…and I look like I’m going to an interview. I had black slacks on, a red handbag and a blue button-up…top shelf (what my husband calls all the way buttoned up). Anyone else look at old pictures and think, “WHY did my parents let me wear that?!”. But all things considered, I think that’s when the love for button ups was birthed. Plaid, denim, flannel, chambray or classic, it’s hard to go wrong with this timeless style. They’re easy to throw and look put together without having to put a ton of effort into…and all the working girls said amen! I got this one from Old Navy, they always have a great fit. I’ve never met a front tuck I didn’t like…but to change up that game I did a half tuck. And let me be honest, it was inspired by when Kaitlyn was The Bachelorette and she wore it, what a babe. 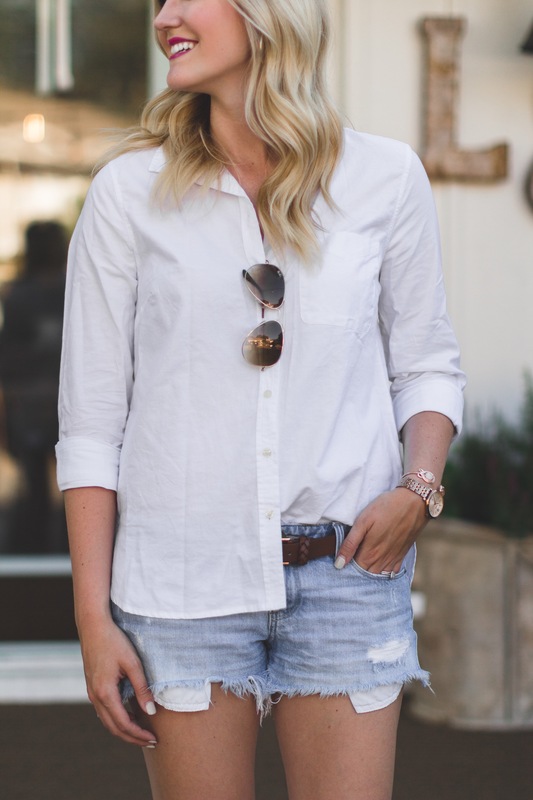 I really like the messy tuck to make it more casual! In an effort to look less like 10 year old me, I paired this with some of my FAVORITE espadrilles that are just the comfiest. This is the first pair I’ve ever had and let me just say, I’m obsessed. 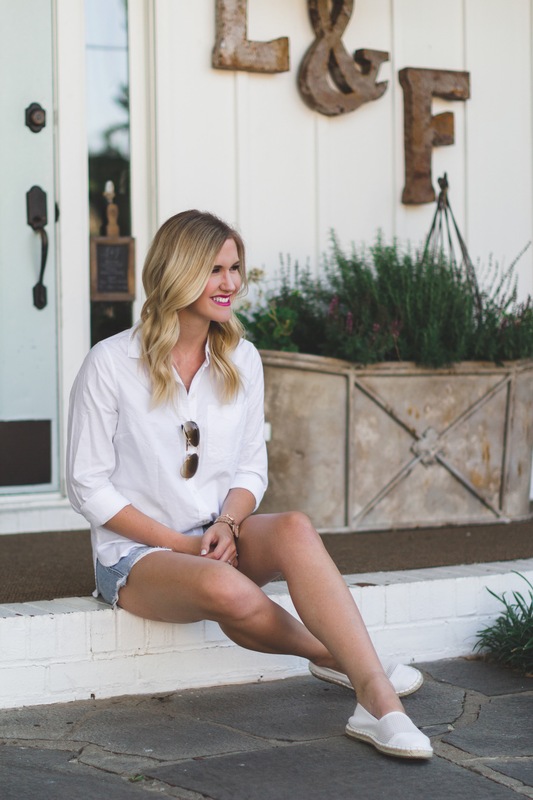 Sometimes it’s just good to get away from the sandals or flats epidemic, and espadrilles do just that! 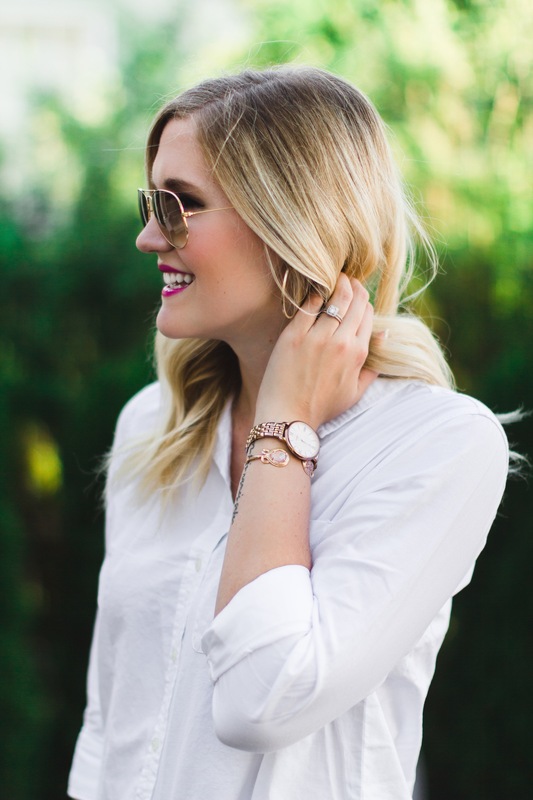 There’s something so preppy and clean about this look that I love! In a top like this, it’s easy to feel put together and casual at the same time. Thanks for reading, friends!